A Monster Calls is a book about nightmares, monsters and death; a darkly beautiful and moving story about a 13-year-old boy who must cope with the fact that his mother has terminal cancer. When a monster begins to show up at his window on a regular basis, exactly at 12:07am, Conor is surprisingly unafraid. Sinister, shadowy illustrations reinforce the atmosphere of despair. Despite its subject, or perhaps because of it, this is a book to treasure. A new non-illustrated edition of Patrick Ness’s Carnegie Medal winner—featuring an atmospheric cover by Jim Kay with an announcement of the upcoming film adaptation. The monster in Conor’s backyard is not the one he’s been expecting — the one from the nightmare he’s had every night since his mother started her treatments. This monster is ancient. And wild. And it wants something from Conor. It wants the truth. 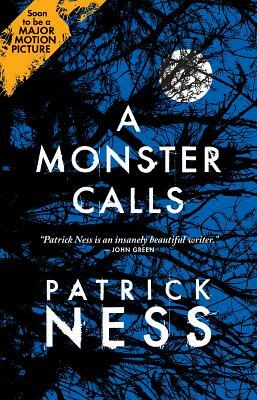 From the final idea of award-winning author Siobhan Dowd—whose premature death from cancer prevented her from writing it herself—Patrick Ness has spun a haunting and darkly funny novel of mischief, loss, and monsters both real and imagined. The multi-award-winning story is soon to be a major motion picture starring Liam Neeson, Felicity Jones, and Sigourney Weaver.